After 20 years of absolute and total dedication, Horror Records has come to an end. A lot could be said here, but I no longer really believe anyone will listen or truly care, so I will keep it short. Horror Records existed for two decades with the sole objective of releasing the best and darkest music around without ever becoming a business or a make-a-living necessity spewing out anything to keep the financial wheels going. It was a profound, heartfelt love for the sounds of Darkness. In these times of internet-induced and short-lived mass hysteria hypes, despicable celebrity taste makers and countless run-of-the-mill assembly line businesses disguised as labels, it has become evident that there is no room for Horror Records anymore and thus the label will be put into the grave in 13 days from now. February 8th will be the last day our webshop will be open. We "celebrate" the funeral with a 30% discount of almost the entire stock which will run from now until the end on February 8th. After this there shall be but silence and emptiness. While I will weep a tear at this grave, I ask pretenders to stay away with their false flowers of condolence. Horror Records is closed for the holidays until December 20th, therefore the webshop is fully closed but will be opened again on December 20th. 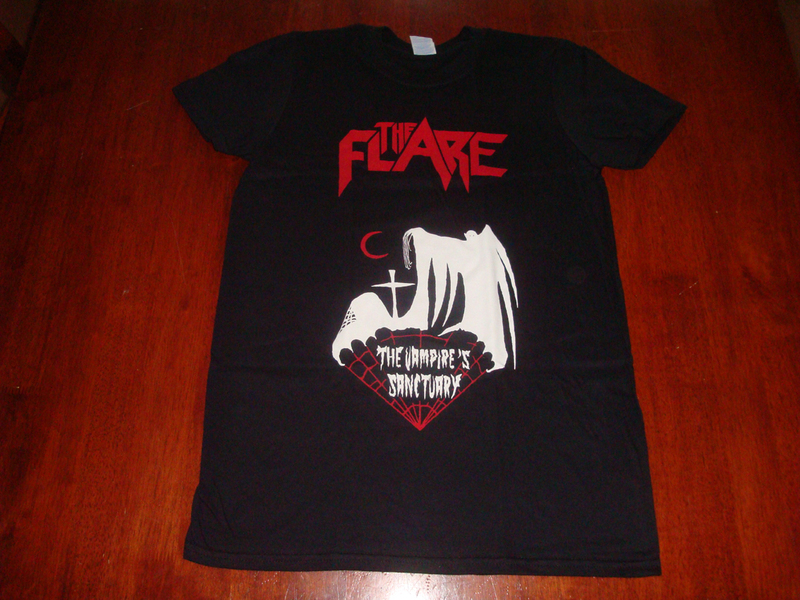 The Flare �The Vampire�s Sanctuary� t-shirt OUT NOW! High quality Gildan Softstyle t-shirt available in sizes S-M-L-XL-XXL in very limited quantities! The Flare �Stardead� 7� OUT NOW! Ridden by a vision to draw a picture of obscure Heavy Rock soaked in a gloomy atmosphere, to evoke the desires that only come for real in dark, insomniac nights, German The Flare was formed in the last days of 2014 by D. Grave, who - with the exception of the drums - records all vocals and instruments himself. Through dark channels unreleased demo recordings made their way to the Horror Records crypt and even in their raw, primordial form these haunting tunes radiated with an aura of obscurity and revealed a very accomplished songwriting. Combining the weight and fury of Heavy Metal with a sometimes somber, melancholic expression, the hard rocking guitar riffs lead through the songs, sometimes being surrounded by vibrating, ghastly organ tones. Inspired by a vast array of both Metal and non-Metal music, The Flare�s ghastly gothic compositions reflect this wide spectrum of influences all while showcasing an abundance of real riffs that make most current Metal bands deadly pale by comparison. Now let the sun set and light the black candles for The Flare�s Haunting Grave Rock! The 7� is available on black vinyl and on red/black marbled vinyl (Horror Records mailorder exclusive, limited to only 100 copies). 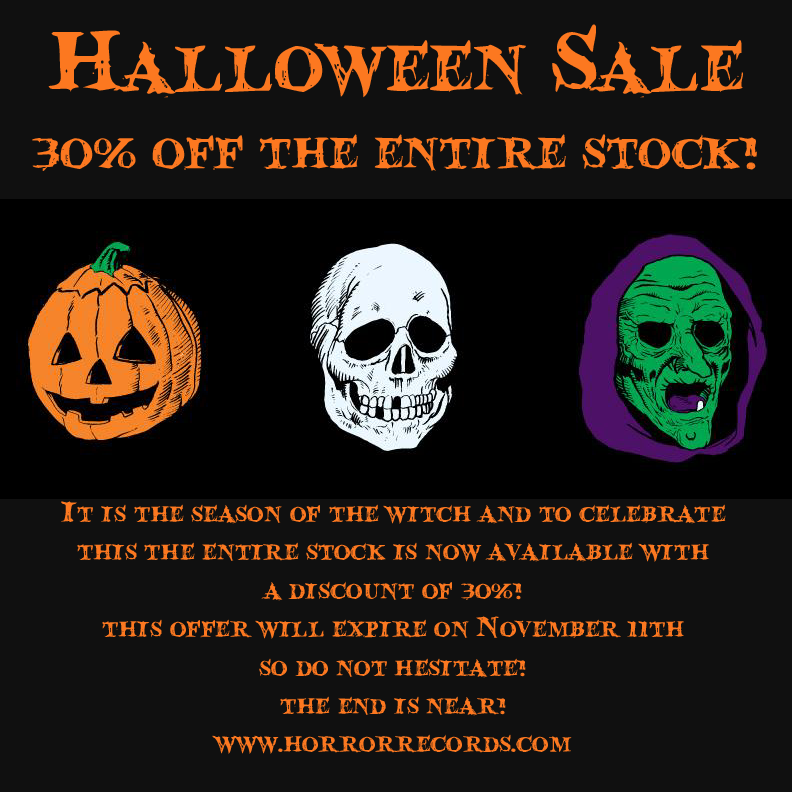 Beginning today and ending on May 31st, Horror Record is having a gigantic clearance sale with several hundred titles available for the lowest prices ever! Tons of vinyl, CDs and mags are now available with discounts of up to 80% of the original listing price! Vinyl and CD prices starting at just 3� and magazine prices starting at just 2�! Help us clear the crypt and make space for new titles and releases! Horror Records will be closed from April 7th through April 25th. During this time no orders will be processed, but you can place your orders as always and all orders will be shipped right after we return! 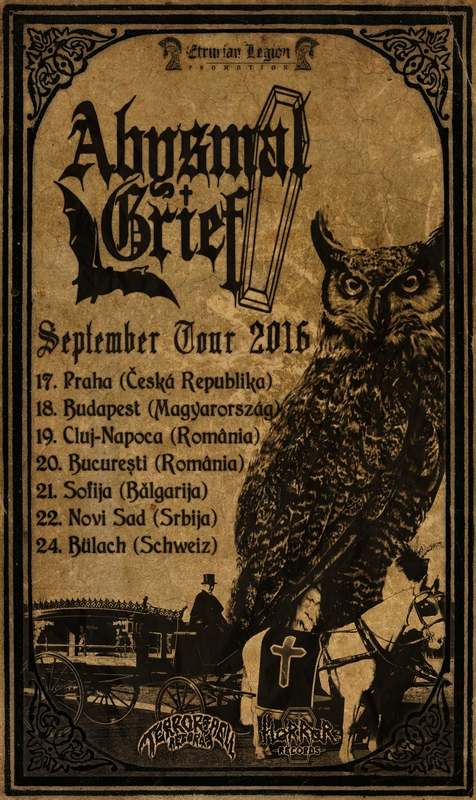 Abysmal Grief/Epitaph �Dies Funeris/Farewell to Blind Men� 12� EP available for pre-order now! To celebrate their European tour together, Horror Records (in collaboration with Terror From Hell Records and High Roller Records) proudly present the split 12" EP of the purveyors of the infamous Italian Dark Sound, Abysmal Grief and Epitaph! Abysmal Grief is represented with "Dies Funeris", a 12-minute masterpiece of the grimmest kind and with a huge sounding production to match, while Epitaph present their Black Hole medley "Farewell to Blind Men", a splendid 16-minute epic with more classic parts than you can follow, also rounded up with a top notch big production. Limited to a one time presssing of only 500 copies the EP comes in a stylish sleeve with gold print and double sided insert with lyrics and liner notes. Of these 125 copies include a woven �Dark Italian Sound� stripe patch of which only a handful are available here as they will mainly be sold on the tour. When they are gone, they are gone. All copies ship from April 7th. Tetrolugosi �Tetrolugosi� LP OUT NOW! Tetrolugosi are Sara Paradisi (keyboards, voices, organs, theremin) and Camillo Perazzoli (keyboards, voice, organs, bass guitar). They like to play theremin and vintage organs producing creepy old sounds. Their lyrics are surreal and often grotesque with enigmatic characters (sumo wrestlers, Japanese insects, robogeishas, sleeping lawyers, golden bugs) populating their world. Blending darkwave and �80s goth with perverse horror soundtrack music, the result is a unique and distinctly Italian sound, full of ethereal and baritone vocals with eerie instrumentation. Reverberating deep lead vocals coming from dark territories blend with angelic otherworldly voices. 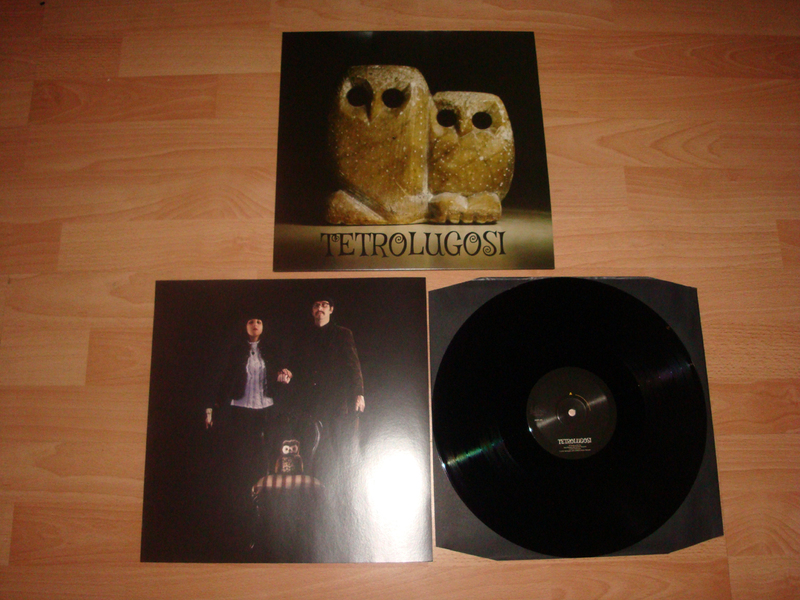 Tetrolugosi �s music is obscure and the owls are not what they seem� The self-titled debut album (previously only available digitally and as very limited MC edition) is now available on vinyl as a high quality LP release in heavy sleeve with insert! 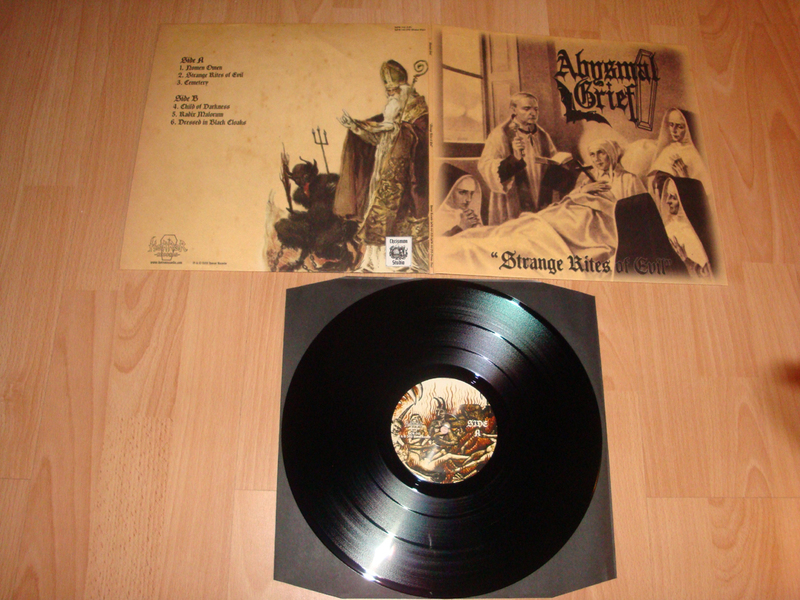 Abysmal Grief �Strange Rites of Evil� LP/picture LP OUT NOW! 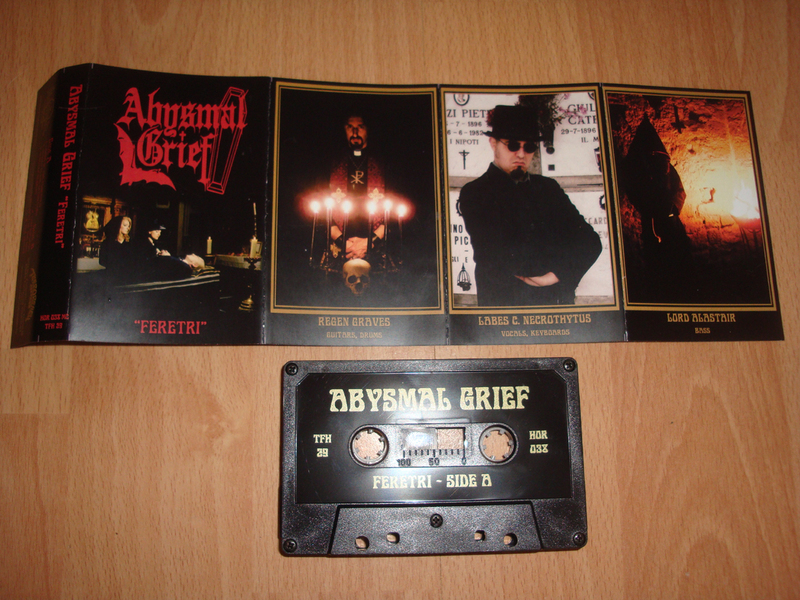 Abysmal Grief have returned from the grave with their fourth full length album entitled �Strange Rites of Evil�. Celebrating their 20th anniversary this year and with no signs of slowing down, this orchestra of necromantical doom have become one of the most persistent both in terms of consistency and following their very own vision. 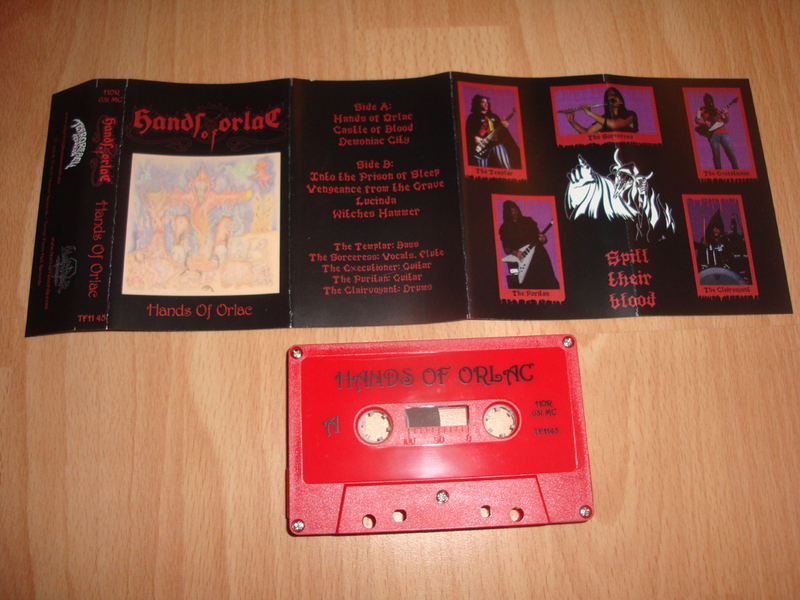 Reunited with original drummer Lord of Fog, �Strange Rites of Evil� shows the band from their most vile and scornful side while still keeping intact the sound they have come to be known for. Always based on simple yet extremely heavy and infectious guitar riffs, the six songs on the album (with one being a cover of the early �70s Pentagram-related Bedemon) are as captivating as they are vile, as beautiful as they are grim, with the sum of the individual musicians becoming greater than the sum of their parts and creating a sound which is both powerful, dark and unlike any other band. The band will be embark on their �Lords of Dark Sound� European tour together with fellow Italian Dark Sound masters Epitaph in April! Recorded, mixed, produced and accursed by Regen Graves at Chrismon Studio (Genova) in Winter/Spring 2015. All songs composed by R. Graves and arranged by Graves/Necrothytus except �Child of Darkness� originally composed by Randy Palmer (Bedemon). MC version will be released late January 2016. Due to the temporary disappearance of the webshop a couple of weeks ago and the success of the sale, we have decided to let the October �3-7-10 Sale� continue for the rest of November as well! A lot of cheap titles have already been sold out, but do not hesitate to take an extra look since there are several titles left for unbeatable prices as low as 3�! 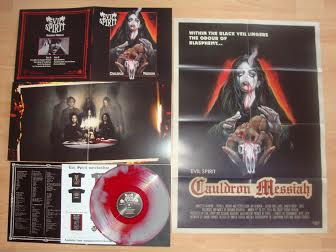 Evil Spirit �Cauldron Messiah� MC available again! 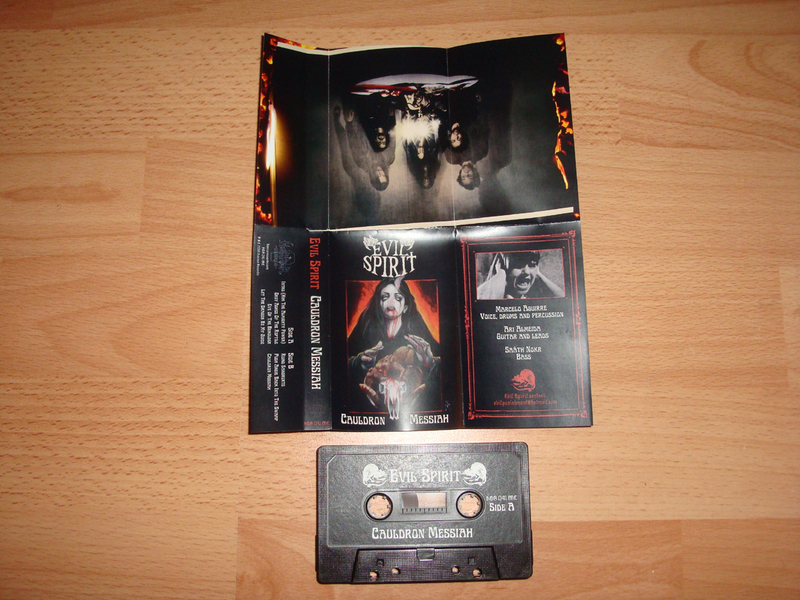 Second really small cassette edition in of only 50 copies on black cassette! 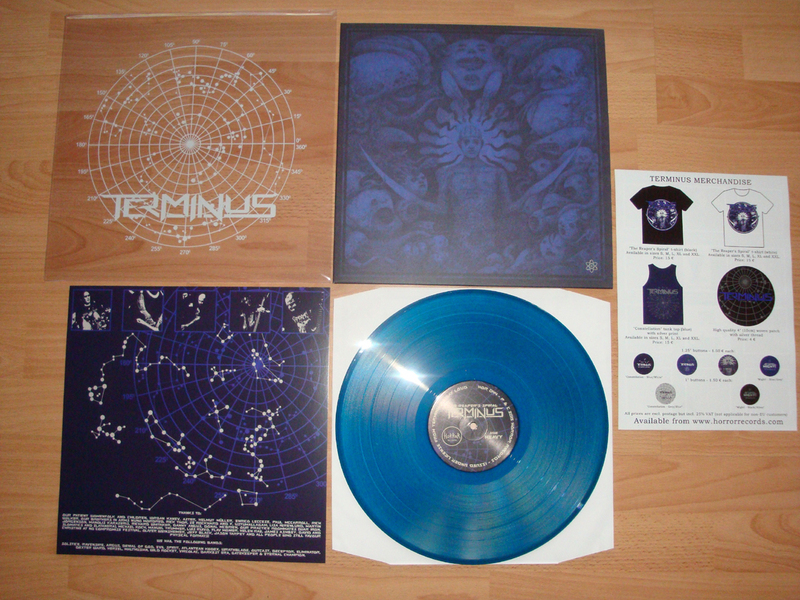 Terminus �The Reaper�s Spiral� LP OUT NOW! Terminus were formed in early 2012 to revel in a style of Heavy Metal rarely glimpsed in the Irish underground. Taking their lead from Iron Maiden, King Diamond, Savage Grace, Slough Feg and Exciter they exist solely to play real Heavy Metal without pose or fuss in a scene where its presence has been sorely missed. "The Reaper's Spiral" marks the culmination of three years hard labour for Northern Ireland's Terminus. Across nine tracks of skull-splitting Heavy Metal mania, Terminus demonstrate their intent to walk a different path from the legion of retro revival bands baying at the door. Showing the same character in performance and distinctive voice in songwriting previously seen on their "Into Exile" demo (February 2013) and split 7" with Portugese heavyweights Ravensire (August 2013) they continue to explore the Sci-fi lyrical themes first touched upon in these highly praised underground releases whilst showing a marked improvement in the power and delivery on display. And while remaining pure in their approach to Heavy Metal, the band is a striking contrast to the would-be-heroic and carefree nature of much of the current retro wave, instead displaying a much darker sound and songs that are filled with a certain melancholy. For in the world of Terminus there are no heroes to be found, only conflicted souls, cowards, losers and machiavellian characters. Terminus invite, nay beseech you, to descend "The Reaper's Spiral". The album�s cover artwork was painted by renowned artist Paul McCarroll who provided one of his rare exclusive pieces made especially for the concept of this album. The first limited edition pressing of the LP is issued with an additional custom made, silk screened PVC outer sleeve which will not be included with subsequent pressings of the album! Available on blue vinyl LP (limited to 200 copies), black vinyl LP (limited to 500 copies) and cassette! The Black �Abbatia Scl. Clementis� LP OUT NOW! Formed in 1988, Italian The Black have remained one of the most reliable bands when it comes to a steady outout of high quality releases. Through one EP and seven full length albums, the band has continued to forge their unique and mysterious Metal Mentis, continuously progressing, all while remaining true to their artistic visions. Perhaps the most underrated and rare album is 1993's "Abbatia Scl. Clementis" which was only released on CD, only pressed once and which has since become hard to find. This album has now - 22 years later - been resurrected by Horror Records on vinyl! The LP comes with the original cover art and a cardboard insert with lyrics and all artwork has been faithfully reproduced in the style of the original 1993 CD release! The final piece missing is now available to complete The Black vinyl collection puzzle! 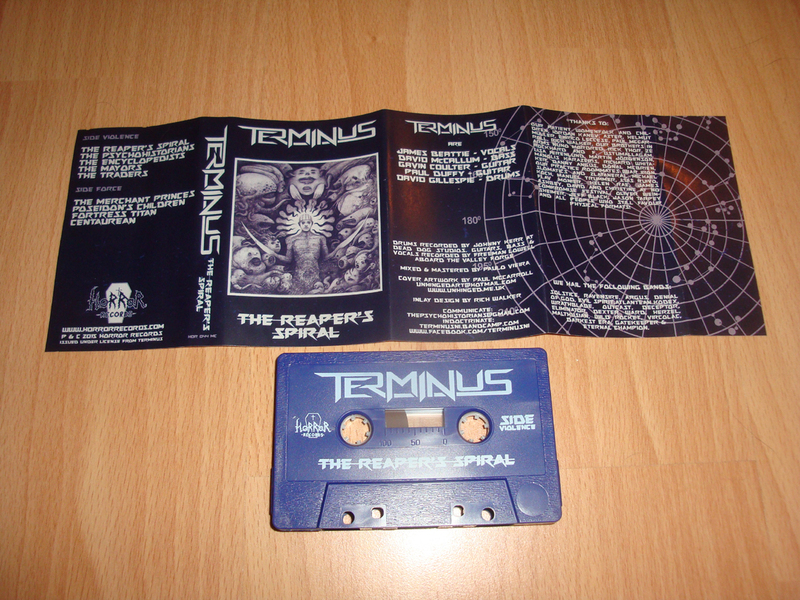 Terminus �The Reaper�s Spiral� MC OUT NOW! LP will be out in September! - First ever vinyl release of this obscure album by the mysterious lords of Metal Mentis! - the third album finally on vinyl with exclusive artwork and A2 poster! - Sci-fi themed pure Heavy Metal which will blow all the pretenders and copycats away! In order to make room for upcoming titles, we now offer a 30% discount on about 300 titles in the webshop (including some items which were already on offer)! Use this opportunity to get some goodies for a great price, and do not hesitate to browse the shop for the titles as many of them are very last copies! The 30% discount will last until and including January 31st - after this all titles will revert back to their regular prices! 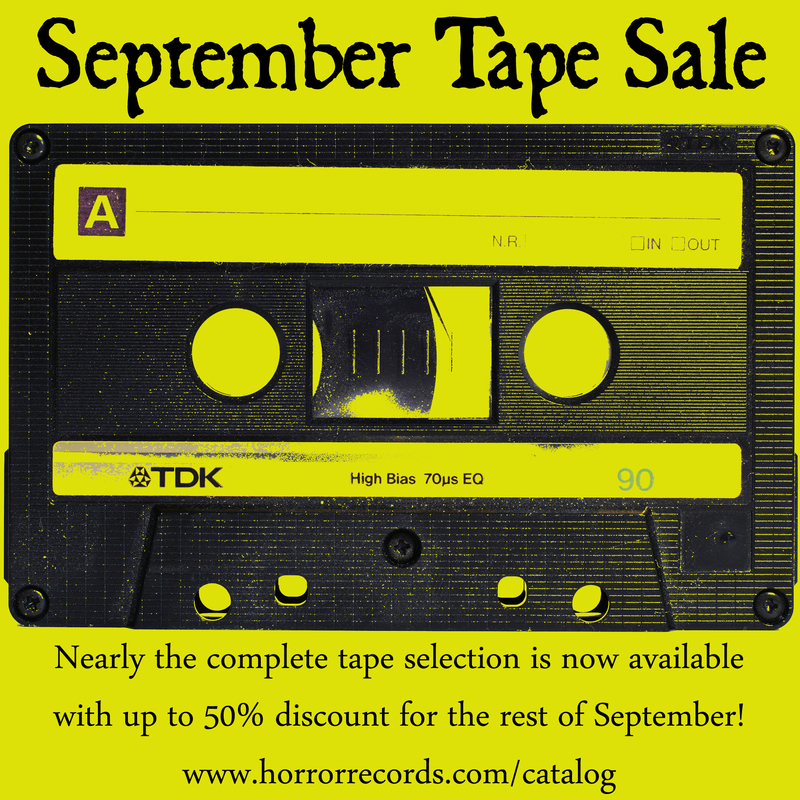 The offer is NOT valid for items purchased through eBay or Discogs, ONLY in the official Horror Records webshop! 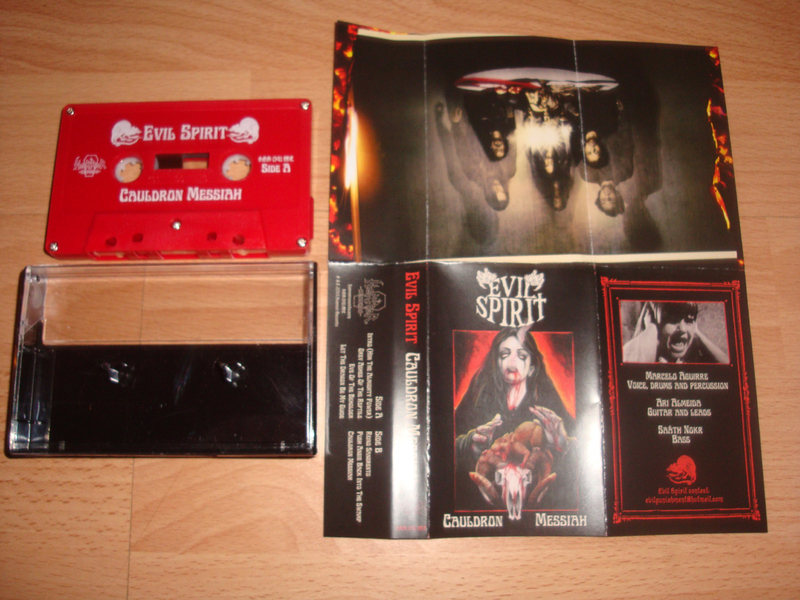 Evil Spirit first caught the world's attention (including their current label Horror Records) in 2012, with the release of their �Sempiternal Punishment� demo tape on Iron Bonehead. Despite being recorded under primitive circumstances as a duo, comprising South Americans Marcelo Aguirre on drums/vocals and Ari Almeida on guitar/bass, the demo was one of the heaviest releases in ages.The tape quickly sold out and was reissued as a 7� EP the same year, as was a second, very limited, private demo tape entitled �Phantom Der Finsternis� which showcased a 21-minute track largely based on improvisation and obfuscating atmosphere, paving the way for horrors to come. Meanwhile joined by bassist Sa�th Nokr, the band entered Big Snuff Studio in Berlin to record the debut album �Cauldron Messiah� in the spring of 2014. Now, after countless hours of intense work around the visual side of the album, in order to convey an integral part of it, �Cauldron Messiah� is finally here. Beginning with an eerie intro which soon turns into a bleeding inferno, it soon becomes evident how heavy this album is going to be. With its songwriting based on gargantuan riffs that are sometimes almost frighteningly back to basics but always spot-on, the unusual structures added keep the songs from being predictable without ever losing momentum. Add to this a drumming which is both primitive and intricate (yet always adds to the songs and never gets overdone for the sheer sake of complexity), twisted and disturbing basslines, then you have the musical cornerstones of Evil Spirit. The lyrical content of Evil Spirit is as dark and disturbing as the music, and can be described as being crude, abstract and not immediately identifiable, having a nightmarish candor delivered by a vocal performance that is an histrionic croon, a deviant whisper, or a violent outburst of the bleakest rage. In fact, being influenced by the dramatic world of crime, fiction and horror cinema, the treat is a kaleidoscopic conundrum of disparate musical influences and imagery put to service of an unpleasant, subtle ride. You shall bow to the Cauldron Messiah!" 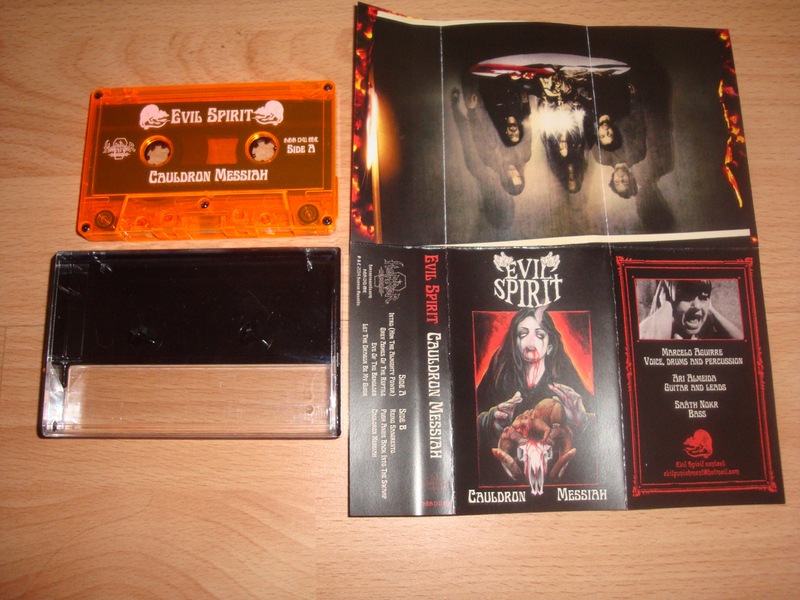 Comes on professionally manufactured red or orange cassette with 4-panel cover! Three years after the release of their self titled debut album in 2011 and the relocation of the original Italian members to Sweden, Hands Of Orlac have finally returned with their second album entitled �Figli Del Crepuscolo� (Italian for �Children Of The Nightfall�). And there could hardly be a more suitable title for this album which was again recorded at Studio Misantropen with Philip Svennefelt behind the console. From the first seconds of the album it is clear that the band has come a long way since their debut. While remaining absolutely faithful to the style created on that first album and being immediately recognizable as the same band, this album seems to have more of everything: Bigger production, more elaborate songwriting and an immense flair for dark atmosphere. The band has maintained their lyrical universe mainly inspired by the gothic Italian horror cinema (for example �A Coin In The Heart� which is based on Mario Bava�s classic �Operazione Paura� (aka �Kill, Baby, Kill!�), and the powerful production perfectly enhances that gothic feel with its big and warm sound which is both clear, heavy, and somehow, strange and captivating� Just like the songs themselves. The LP comes in a heavy gatefold sleeve including a 6� sticker. Available on black vinyl and on purple vinyl (Limited to only 200 copies)! 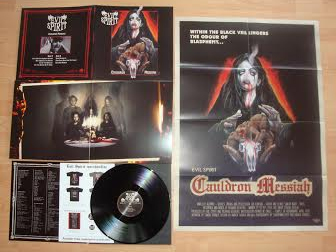 The LP comes in a heavy gatefold sleeve including a huge A1 movie style poster. 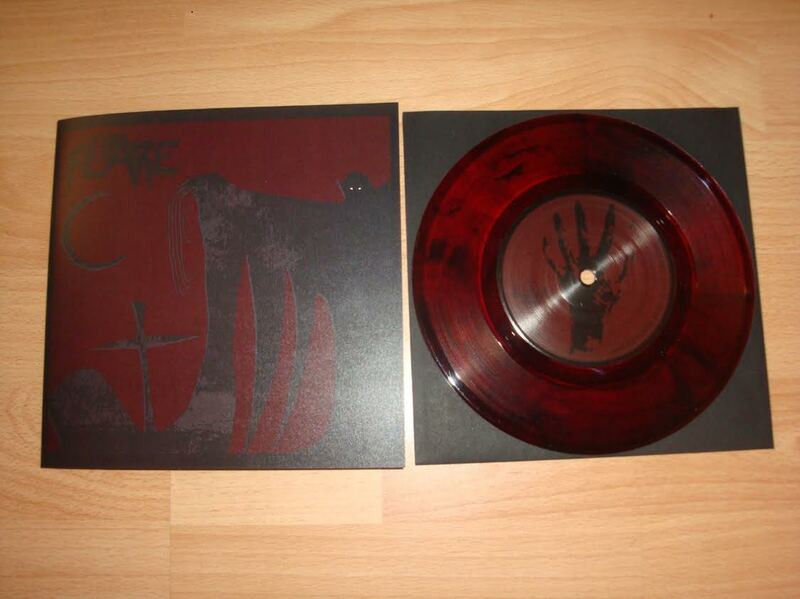 Available on black vinyl and on red/grey vinyl (limited to only 200 copies)! As many of you have already noticed, the webshop has been down for several weeks already due to technical issues on the server. The shop should finally be back online and fully functionally very soon again, and a massive update of new items will be done once everything is functioning again! Meanwhile we wish to direct you to our alternative sales platforms on eBay, Discogs or the Horror Records Bandcamp site. After years in the making, Horror Records proudly presents this anthology of what could easily read as the most underrated Danish Metal band from the '80s. This anthology contains all studio material ever recorded: The "Crucifying The Virgins" demo tape (1986), the "Metal Outlet" compilation tracks (1987) and the "M.A.D.H.O.U.S.E." demo tape (1988). Furthermore the band dug deep into their dusty archives and unearthed a soundboard live recording from their very last show ever in December 1989. Besides songs known from their demos and the compilation LP this recording contains no less than 6 previously unheard and unreleased songs which have never been circulated in any form whatsoever. To top things off an additional uncirculated track from another soundboard live recording has been added as well, making it a total of 7 previously unheard songs. As the original master tapes of the studio are no longer in existence, the studio material has all been taken from original demo cassettes and vinyl and the live shows have been taken from the master cassettes. All carefully mastered especially for vinyl at the renowned Lundgaard Studios by Charlie "Goodtime" Jensen who was also the producer on both original demo tapes, the songs have never sounded better and will stand as a posthumous monument for the amazing band that was Metal Cross! 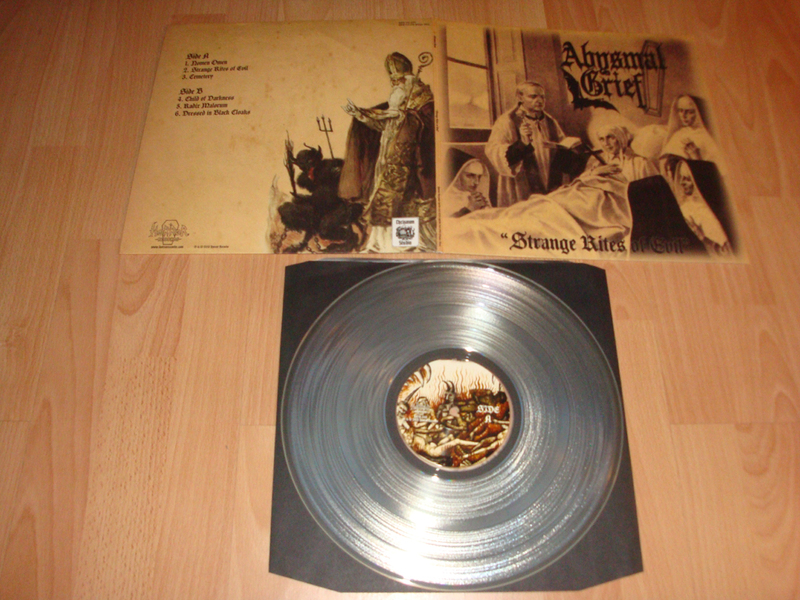 The packaging of the release more than does justice to the material presented and the album comes as a double LP with extra 7" (with its own sleeve), all packaged in a heavy gatefold sleeve with stunning and very elaborate silver foil stamping on both front, back and inside the gatefold. Furthermore a 12-page 12" x 12" booklet which contains extensive liner notes from both vocalist Henrik and Horror Records, all lyrics, original demo covers, tons of rare and never-before-seen photos, magazine clippings etc. is included - all with silver printing added to suit the album's sleeve! Available on black vinyl and on silver/black vinyl (limited to only 150 copies)! 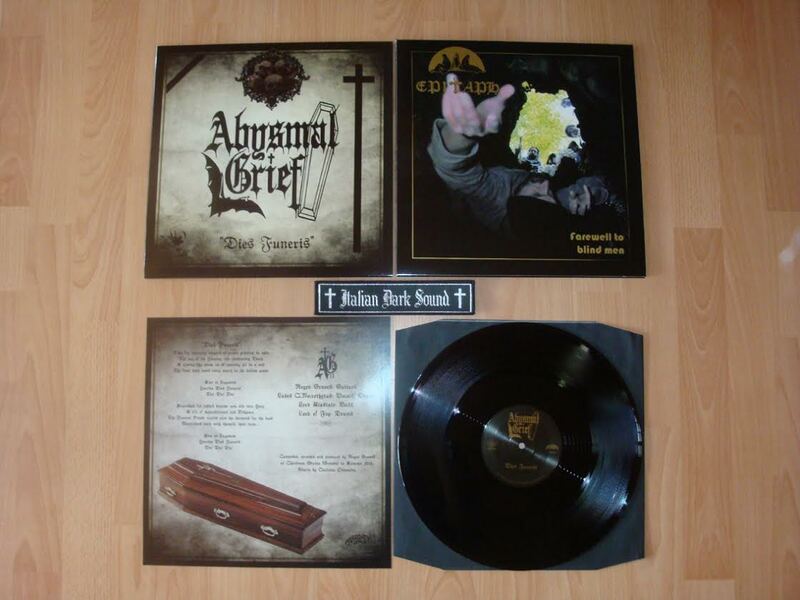 Abysmal Grief �We Lead The Procession� LP out now! 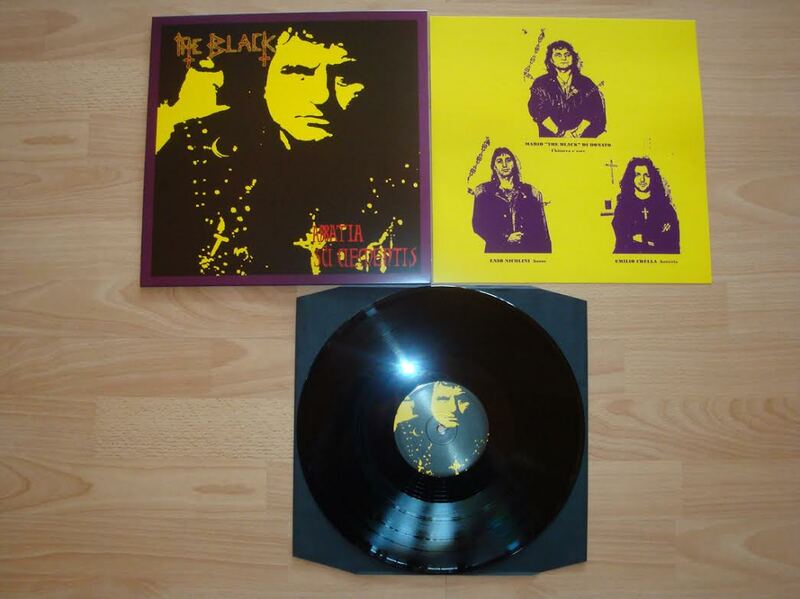 The LP is limited to 500 copies on black vinyl only and never to be made available again! The MC version will be shipping around April 21st and will be limited to only 100 copies � available for pre-order NOW! 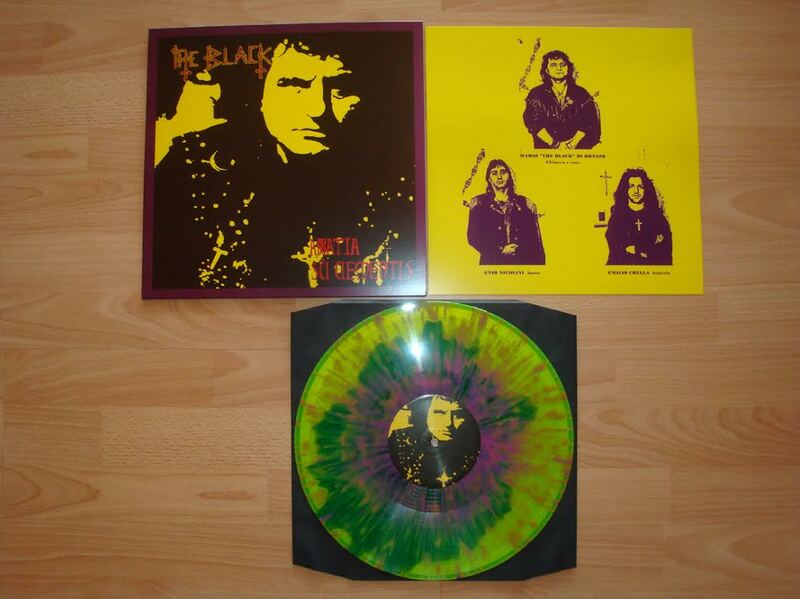 Metal Cross merchandise in anticipation of the soon to be released anthology 2LP + 7� out now! The album will be released on April 27! 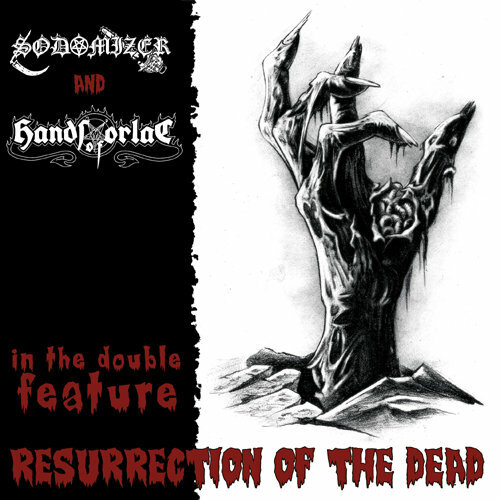 Sodomizer/Hands Of Orlac - "Resurrection Of The Dead� 7� EP out now! Brazilian Sodomizer and Italian/Swedish Hands Of Orlac might at first glance seem like an unlikely coupling for a split release. While it is true that the bands might be far removed from each other musically, both bands have ongoing themes based on horror and, what is more important, have been crafting their own individual styles for years and are equally recognizable in the endless sea of copycats and pretenders. With both bands having released their albums on Horror Records (with more to come in 2014) we felt there was no way around this release conceived in fraternal unison by the bands. This is a release for those with an ear for good (or rather, evil) Metal and it is a sharp-spiked fist in the face of those more concerned with putting a category label on bands and whether this category currently allows a band to be considered cool. For everyone else it will be a horrific listen! 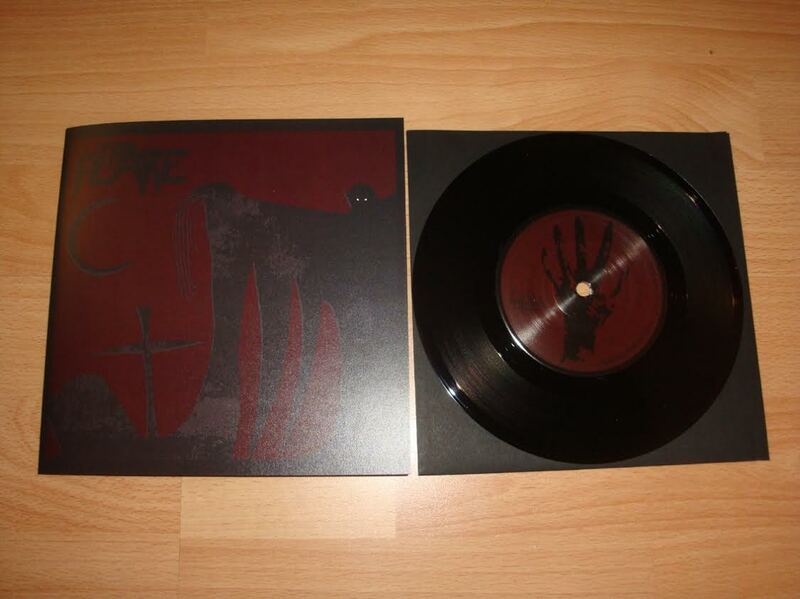 The 7� EP contains an exclusive song from each band and is limited to 500 copies on black vinyl only! Horror Records is moving to a new location, so from August 7th until about August 21st no orders will be shipped. Orders can still be placed as always, but no shipping will take place again until about August 21st. Also we cannot guarantee too much email correspondence during this time. Moving to the new location will mean that we will continue to ship using the cheap German DHL but that shipping will again take place on a daily basis unlike the weekly basis it has been for the last few months! 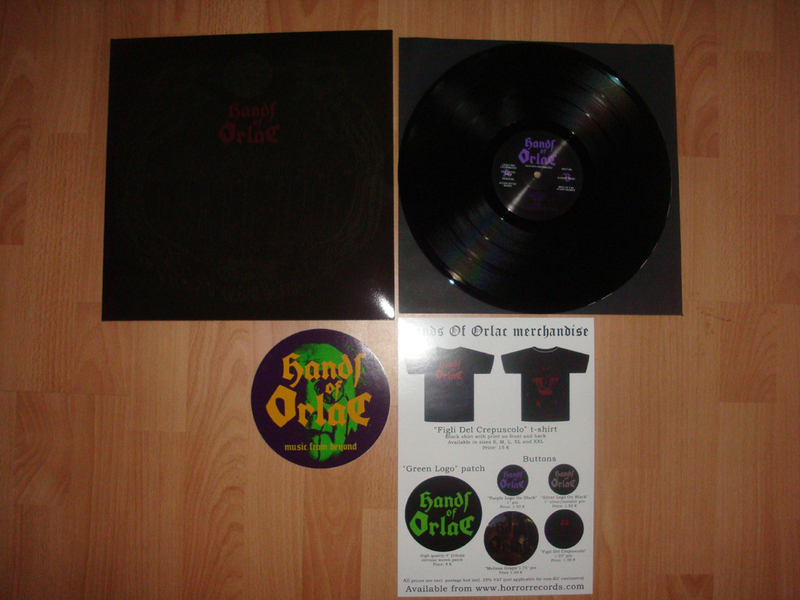 Black Oath �Ov Qliphoth And Darkness� 2LP -- The return of Cursed Rock Musick! The second album! The double LP comes in heavy glossy gatefold sleeve with silk screened D side. 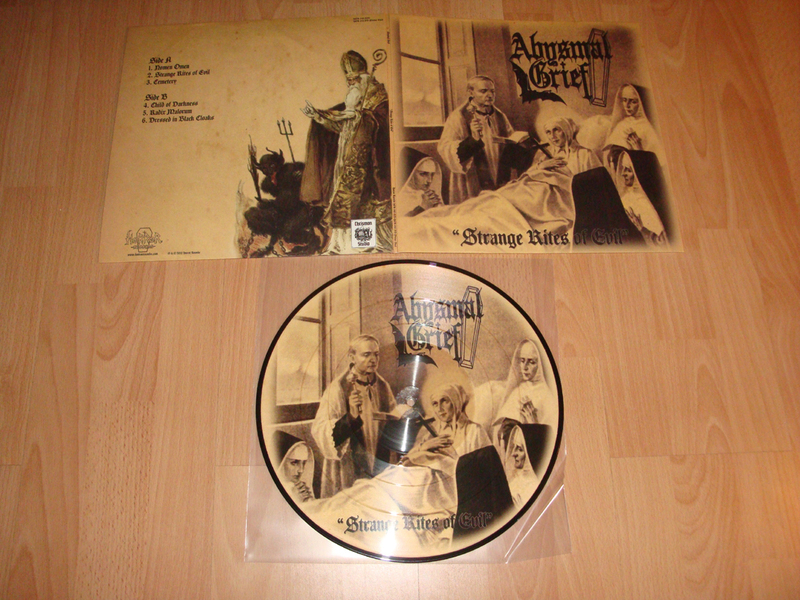 Abysmal Grief �Feretri� LP & MC -- The third album from the necromantical masters! 4 years after the Death celebration �Misfortune�, Abysmal Grief have returned with their third macabre opus entitled �Feretri�. For nearly two decades these lords of funerals have evoked gloomy musical portraits of Death like no other band, and their grotesque, necromantic hymns reach a new disturbing zenith with this occult masterpiece. Sinister, macabre and evil, �Feretri� is another baroque landmark on the terrifying orchetra�s path to eternal doom! Join them in Death! The LP comes in a heavy glossy gatefold sleeve with gold print. The MC comes on professionally manufactured cassettes. The Black Oath �Ov Qliphoth And Darkness� 2LP has been submitted for production and will be out in May! It will be released as a gatefold double LP with silkscreened D-side and contain a vinyl-only bonus track, a cover of the Acheron classic �Ave Satanas�! An MC version will be released as well � more information as the release date draws nearer! The Abysmal Grief �Feretri� LP has finally been shipped from the pressing plant and should arrive here at the end of the week. All Danish pre-orders will be shipped Friday 12th and all international orders on Monday 15th! The limited edition of only 100 copies on red vinyl is almost sold out, so if you need one, do not hesitate to order your copy! The MC version will be released shortly as well! Welcome to the brand new Horror Records website! You will now again be able to find information about all of our releases � past, present and future as well as song samples from all currently available releases! Furthermore the webshop has been completely redone lately and you will now also be able to search for items by label name!